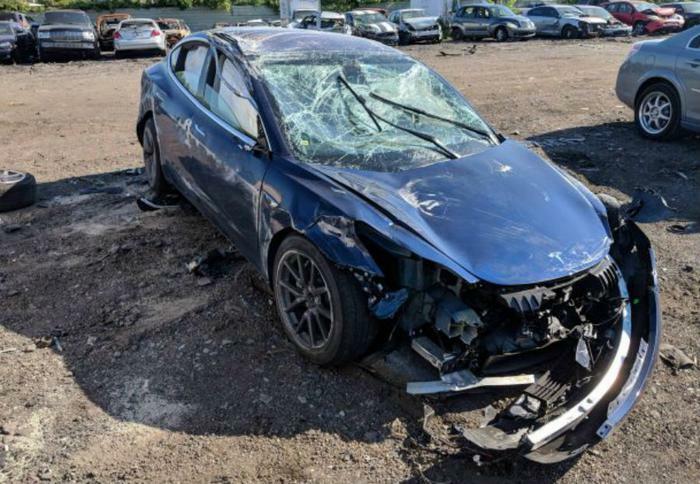 Tesla's Model 3 electric vehicle has yet to receive an official NHTSA safety rating, but a real-world account of its performance in a crash suggests the vehicle does an exceptional job of protecting its occupants. A Reddit user shared details of his wife’s accident while driving a three-month-old Model 3. During the accident, the vehicle rolled over multiple times before ending upside down. Although the vehicle was totaled, his wife suffered only a compression fracture, friction burn from the airbags, and some bruises. Rollover accidents in electric vehicles are rare because of the large battery pack installed at the bottom of the vehicle. But despite their low center of gravity, rollover accidents in EVs can still occur. The way this accident ended suggests the company didn’t neglect to include potentially life-saving safety features in its frantic push to hit its production target. However, the result of this accident is by no means a replacement for official third-party crash test results. The IIHS is currently testing the Model 3. Despite a string of incidents calling into question the trustworthiness of the electric car maker’s Autopilot feature, Tesla has maintained that safety is always its number one priority. Last year, the company revealed in a letter to shareholders that early Model 3 crash tests yielded positive results. “Initial crash test results have been positive, and all Model 3-related sourcing is on plan to support the start of production in July,” Tesla said.